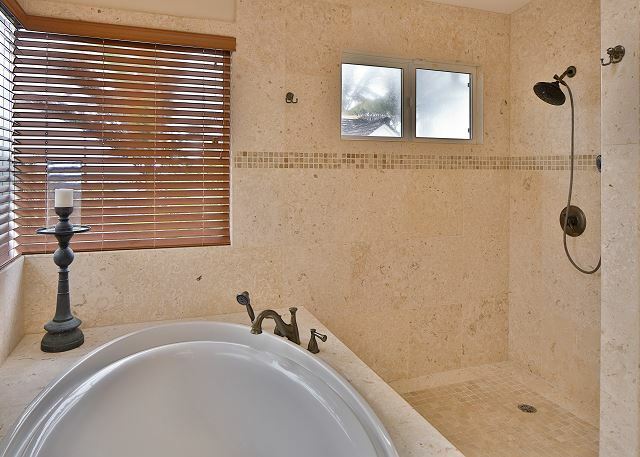 Welcome to Beachside Villa, recently built custom 4BR, 4 bath island style home just one house (100 steps) or a 60 second stroll down the private beach access to the sands of our world famous Kailua Beach. The spacious main level provides a wonderful setting for both relaxing retreats and long over-due gatherings. The decor is Indonesian inspired with comfortable luxurious furnishings. The kitchen is large and open overlooking the family room. 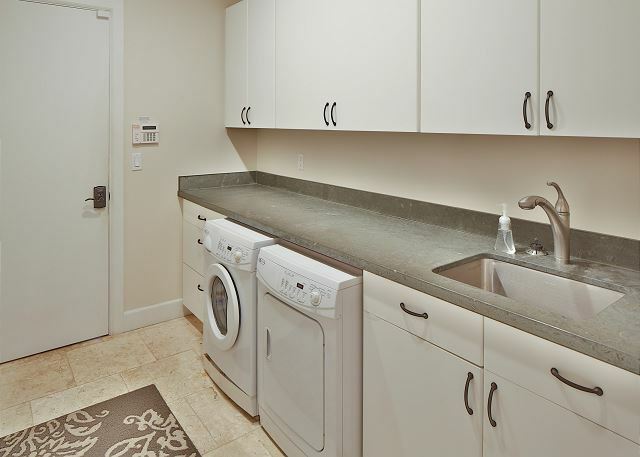 Any chef will feel at home with the top-of-the-line appliances and ample work space. There are three living areas. One is adjacent to the kitchen overlooking the pool. A second more private living area is located on the ground level with a garden view. The third living area is located upstairs off the bedroom suites. 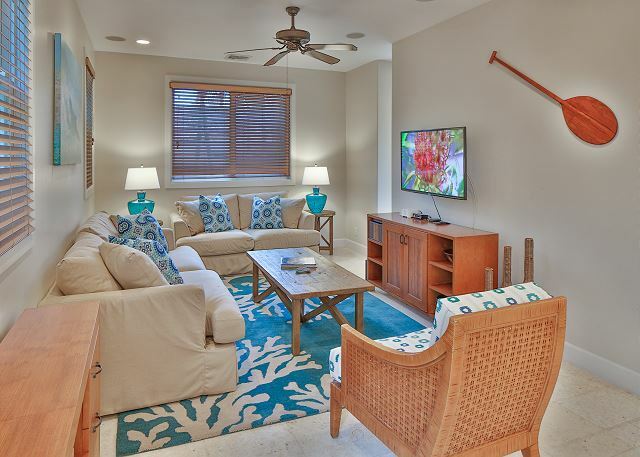 Beachside Villa offers plenty of space for quiet conversation or a group activity. The second level consists of the four bedrooms and the additional living area. The upstairs living area offers also a queen sofa sleeper couch as additional sleeping area for two. 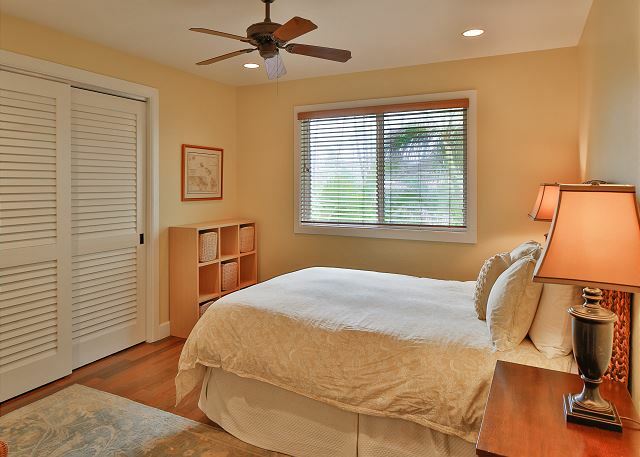 The distinct Master Suite offers a King size bed, single day bed, full bath and lanai with ocean views. 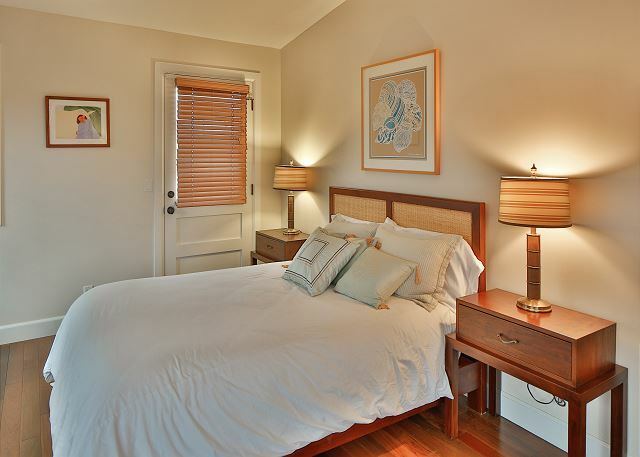 The second bedroom is equipped with a Queen size bed, trundle bed, full bath and partial ocean views. The third and fourth bedrooms each have queen beds. Central air conditioning runs through the entire home. Lush landscaping highlights your private pool and Jacuzzi at Beachside Villa. Dine under the sun and stars in this comfortable setting with seating for six. 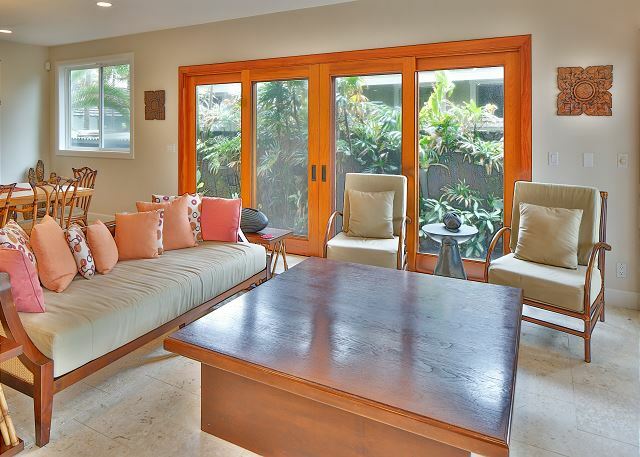 Enjoy private beach access to the soft sands of Kailua Beach just one house away. Kailua Beach offers many activities from leisurely walks along the crescent shape beach to action packed sports such as windsurfing and kayaking in turquoise blue waters. Beachside Villa is a lovely vacation home in a truly charming setting. Come and relax! 5 adults and 4 kids all under 4 years old. House was much larger than it looked in pictures. Great cooking and common areas (HUGE) and had everything you could want in the kitchen. TV room was offset so it’s not a focal point. Pool was fine and hot tub was great. Outdoor area was a little rough for the 1 year old. Beach was a 45 second walk. Amazing beach and lots of beach toys and boogie boards and chairs. Nice downtown area with shops and restaurants. Bedrooms were really nice and another common area upstairs. Kepola greeted us and gave us the rundown and was available anytime we had any questions. This is a perfect vacation house, very spacious, amazing kitchen, so close to beach. The house was very clean when we arrived. Its really a beautiful house with high end finishes. There are many different areas to gather. Beach towels and gear was provided. The property managers Kepola and Shawn were very helpful. We would definitely rend this place again. This is the second time we've rented this house wit in the past two years. While the house is not as new as our first visit it remains in good condition. I highly recommend it as the house has everything needed for a perfect family vacation. The location is just steps to the beach and the pool is well maintained. Fun family location and convenient to the beach. House was wonderful for multigenerational get together. This luxury home was wonderful. We were one house from a sandy beach and enjoyed the boogie boarding so much. We loved cooking in the gourmet kitchen and enjoyed the spa as well. 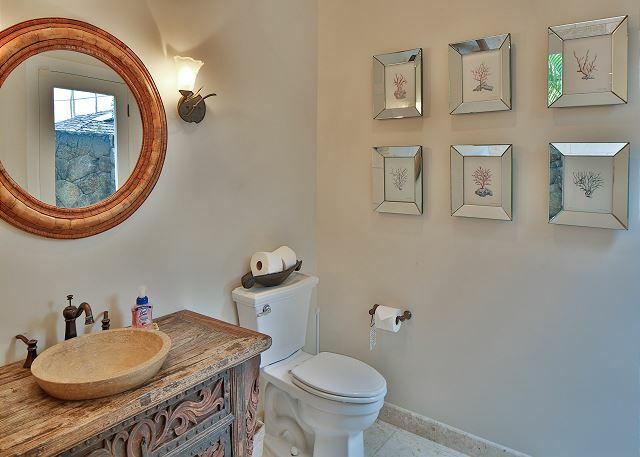 The home was clean and beautiful with wood and tile floors throughout. The property managers were professional, helpful and warm. We want to book this property again. Aloha!!!! My family enjoyed out stay at this home immensely. All the rooms we spacious, and furnished nicely. 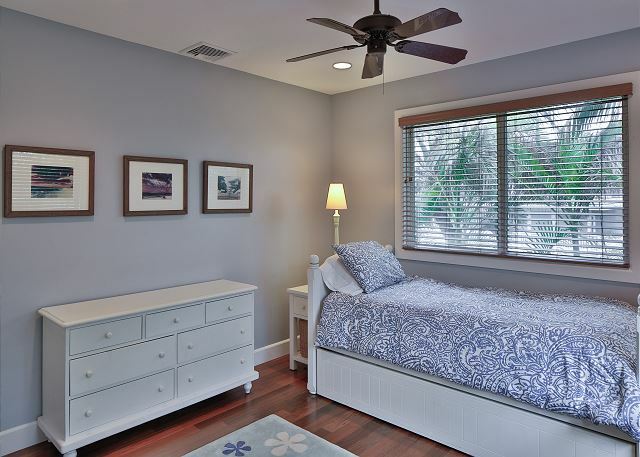 The location is a few steps from the beach, and the town of Kailua, only a few minutes away, had many fine choices for restaurants and shopping. The house has a super layout and is extremely well equipped. We had children and three adult couples and all found the place to be exceptional. Checkin/check out was easy and the place was 100% ready for our stay. The location is terrific - and the pool is a great way to finish off a day. We will be back. The Beachside Villa was perfect! We had 2 families of 4, each with children 1-5 years old. The house was great for us! The location was ideal, very quick walk to Kailua beach. The pool, while a little small, was nice with the kids and having a gate made us not worry about the little ones. The inside of the house was great, very spacious, nice furnishings, amazing kitchen, etc etc. This was an ideal spot, we didn't want to leave!! Great house for a large family group. This is the only house we've ever rented that had all of the cooking supplies and plenty of quality pans , knives, plates,etc. the house is one off the beach so it s about 80 -100 steps to the beach. The pool has a tile bottom which makes it oh so nice. The interior of the home is very luxurious with wood floors, nice art work, and plenty of comfortable furnishing. We highly recommend this property. We celebrated an anniversary with kids and grandchildren. The property offered something for everyone. Very friendly and relaxing, just like the community of Kailua. A great property. We brought all of our children, 9 people in all The location is wonderful and there is plenty of space. We loved the kitchen. We cooked meals together. It was very well appointed. Thank you for letting us share your wonderful home. Our family had a wonderful experience with this rental. The space is amazing along with the decor. We loved the kitchen and it was fully equipped with all of the essentials. The location is fabulous - just a few steps to the beach. The best part for my kids (all over 18) had to be the surround sound system by the pool and hot tub where we spent our evenings. We look forward to using this rental again. 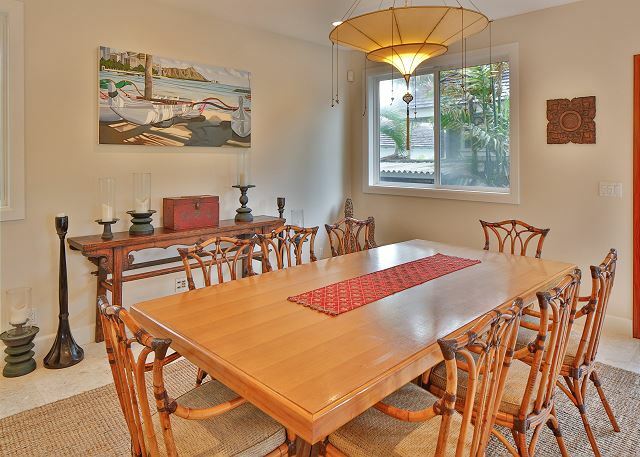 Very nicely furnished, large rooms fit for family entertaining. Well equipped, quality appliances. Bedrooms also good size particularly a huge master bedroom. Location is excellent, however do not expect more than a horizon sunset view. Re. maintenance, air conditioning in the second master bedroom did not work, we noted this the day we arrived, but it was not corrected. Although we managed by opening all windows, for such a top quality house, it was a non-plus. A suggestion: add serving platters, we could not find any. Overall a lovely home. The home was absolutely perfect. We could not have been more pleased with the location and condition of the home. Five star all the way!! The house was beautiful and well maintained. It was near the ocean. The house was well supplied with the necessities. The few problems we encountered were immediately taken care of by the very professional rental agency staff. A perfect house for a family vacation. We were happy to stay in, relax by the pool, walk the beach and make great meals in the amazing kitchen. Our home away from home in Hawaii! Being able to walk to the beach is great - add a pool right in the yard and you have perfect. The pool has a child safety fence so our kids could go in and out without us having to worry about them. This house a great place to stay and has everything you need for a fun vacation in paradise. Kailua Beach and the Beachside Villa served as a meeting place for my family and our in-laws, stationed in Okinawa, Japan. What a fabulous place to meet and be able to enjoy each other's company! This house was incredible! The decor was modern, the kitchen was awesome, and almost every utensil, pot, pan, or appliance was provided in the home. Viking appliances were phenomenal, and the layout of the home was so conducive for our large family set of 9 (including 5 kids, 5-13). We loved the home and the kids absolutely loved the pool. The owners even provided sand buckets and toys to take to the beach! We would definitely recommend this home for anyone wanting to take it easy without any worry regarding modern conveniences and for it's prime location. The property manager who met us upon check-in and check-out was awesome, giving us some "pearls" on what to do and where to go on the island. Would definitely return here on my next trip to Oahu!